Aarambh Trust was founded in 1996 to address the needs of the most marginalized sections of society: disadvantaged children, youth and women, and to provide them with education support and/or employability skill training to improve their future prospects. Aarambh Trust currently serves approximately 2,000 beneficiaries, in the areas of Navi Mumbai and Satara. The strength of the program lies in its ability to unite members of the community for the purpose of development. For example, youth who were previously students in the after-school programs now themselves organize awareness drives in the community, be it motivating parents to send their children to school to organizing anti-tobacco campaigns. Women are encouraged to take on leadership roles in the community, reaching out to other women and migrants to promote literacy, etc. Aarambh Trust plans to expand their program to other areas of Navi Mumbai and rural Western Maharashtra, especially areas with a high incidence of migrant populations. Total Income: Aarambh Trust witnessed a drop of about 20% in its total income generated in FY13 (Rs5.5mn as against Rs6.8mn in FY12). The main contributing factor to this decline was the reduction in donations from corporate sources, which decreased by about 35%, from Rs5.4mn in FY12 to Rs3.5mn in FY13. Corporate Sources: Income from corporate sources in FY13 was lower than any of the three previous years, which was approximately Rs4.5mn on an average. This is because in the previous years, donations were being sought from corporate donors for infrastructural inputs at the centres, such as computers, furniture, classroom equipment, etc. Non-government Funding Agencies: Income from non-government funding agencies increased by 86% in FY13 and amounted to Rs1.3mn. 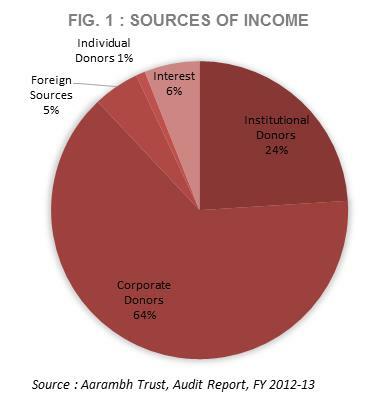 Individual Donors: Individual donations amounted to only Rs0.05mn in FY13, dropping by 50% from Rs0.1mn in FY12. Interest on Investments: Interest on fixed deposits amounted to 6% of total income in FY13, which indicates efficient management of idle funds by the Trust. Corpus Funds: The Trust does not have any corpus funds, but will be working on raising donations for the same in the near future. Program Expenses vs. 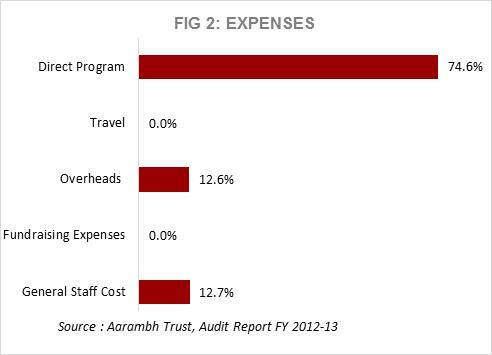 Overhead Expenses: Program-related expenditure amounted to almost 75% of total expenses, amounting to Rs3.66mn. Expenditure on overheads was just over 12%, which is fairly below sector average of around 18%. (Ref: Fig.2) There were no expenses incurred exclusively on fundraising. Reserve Funds: The Trust has accumulated surpluses amounting to Rs6.8mn. The Trust has no other liabilities. Income Growth Rate (IGR): Aarambh Trust has displayed erratic annual IGRs over the past years. The IGRs have varied from -19.7% in FY13 to +32.1% in FY12. One reason for this is that in the years where infrastructural support was sought and raised, the inflow of funds increased, whereas in other years, the income was enough to cover operational costs of the program. Self-Sufficiency Ratio (SSR): The SSR of Aarambh Trust is very low, only in the 8-10% range. This is because there is negligible contribution from individual donors, and reliance is placed mainly on corporate sources. Cash Flow Management: Aarambh Trust often experiences intermittent fund flows from corporate partners, whereby disbursements are either delayed or are sanctioned all at once, which results in challenges in planned utilization. Further, the Trust has not been able to obtain professional accounting support to practice better cash flow management. Lack of Collaboration: The Trust also faces difficulties in collaborating with Mumbai-based NGOs as these organisations tend to prefer engaging within the city and not integrate with Navi Mumbai or district-level NGOs. Political Interference: Local goons often create opposition at the community level and cause obstruction in program operations. Lack of Influence at State Level: While Aarambh Trust has managed to create a good rapport with the local municipal corporation, they are yet to break through to State Level networks. Founder Trustees Mr. Sudhir Sudhal and Ms. Shobha Murthy were both former team members at CRY, Mr. Sudhal being Senior Development Manager for 15 years, and Ms. Murthy being Finance Manager. Ms. Murthy now has a full time role as the Program Manager at Aarambh Trust. TKS Murthy, Trustee, is a retired scientist who was formerly with the Bhabha Atomic Research Centre (BARC). His passion for education has translated into most of the Trust’s students discovering their own passion for Math and Science. Ms. Vijaya Chakravarty, Trustee, is a psychologist who was previously associated with Sophia College for various adult learning courses. She is also a landscape designer and environmentalist. Aarambh Trust has received an award from the Association of Journalists (Navi Mumbai) and also the Karamveer Puraskar from ICONGO, which is a Delhi-based organization that promotes credibility, transparency and accountability in the social sector.